Brownies are a chocolate lover’s dream with a hint of vanilla and a dash of chopped nuts for texture. Perfect for all occasions. Brownies are crisp on top and chewy inside. 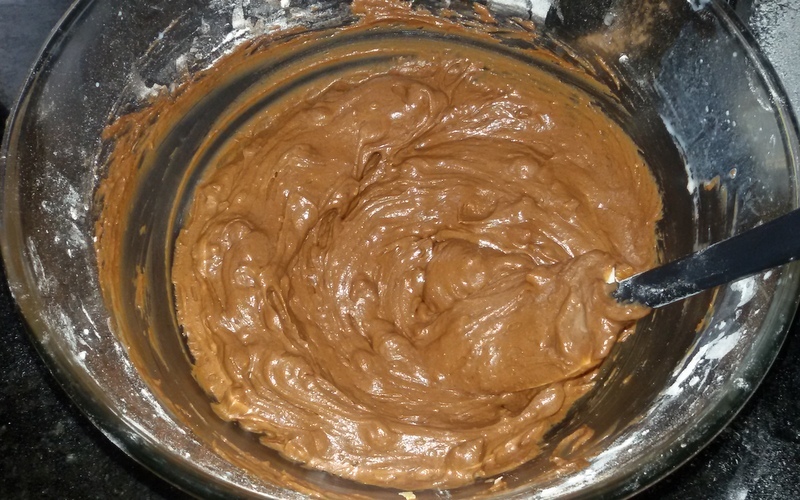 I love them because they satisfy my chocolate cravings, and are super easy to make. 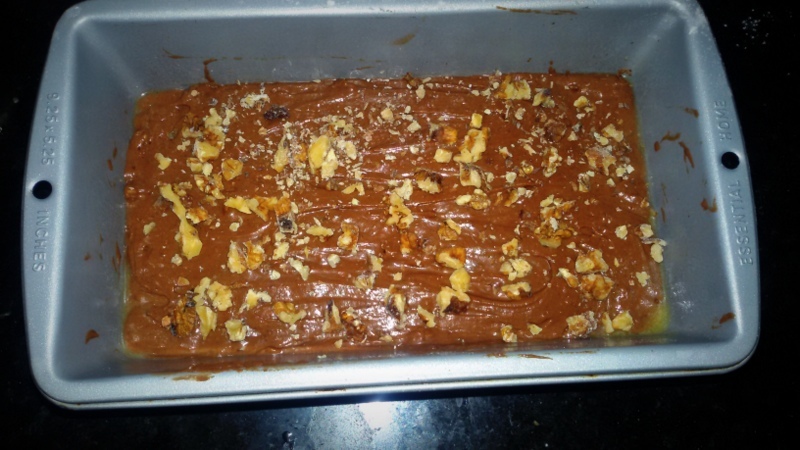 Difference between chocolate cake and chocolate brownie is pretty simple, brownie doesnt need much of leavening ingredient and uses small amount of flour. Enjoy warm brownies with vanilla ice cream or with a with a tall glass of milk. These brownies will last up to 3 days in an airtight container at room temperature. Sieve together flour, soda, cocoa powder and coffee powder and keep aside. In another bowl beat the butter, sugar and buttermilk together. Add vanilla essence and jam and mix. Now add the dry ingredients into the batter and gently fold to combine until there are no lumps. 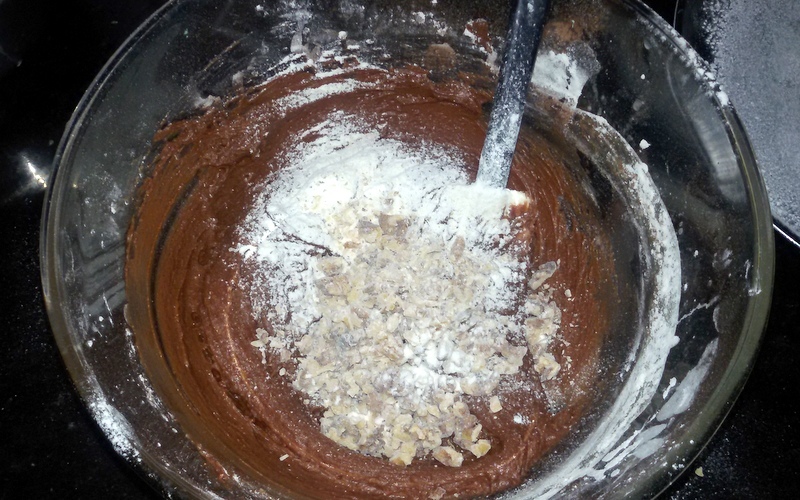 Toss chopped walnuts in flour and add them to the batter and mix slowly. Grease a baking tray/mould, dust it with four and pour the batter into it. Bake it for 30 minutes or until the top crusts forms well. Cut to desired shape and serve with some vanilla ice cream on top. 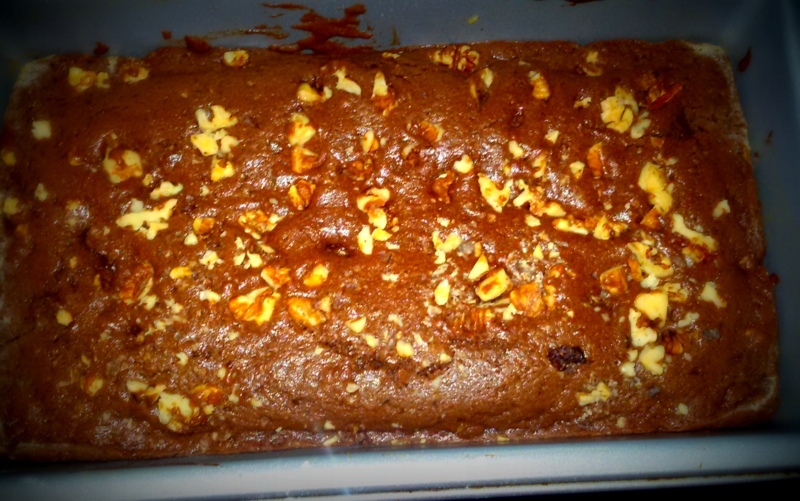 Enjoy these delectable rich brownies with your loved ones!! PS:- No after pics, rushing to meet some friends to party 🙂 Will add next time for sure. Prawns/shrimps are always special to me because it gives me so many memories of my childhood, when dad used to prepare this spicy prawns curry with so much attention to detail to make our sundays lunch perfect.I usually dont like sea food much as I feel if they are not made correctly they can have that raw smell which totally puts me off. So I am usually hesitant to try prawns else where. During my wedding I made dad teach me his style of pranws curry and I cook often now. I love biriyani so much that I am always making excuses to make at home, the aroma that biryani fills in the air and makes my normal day quiet special. 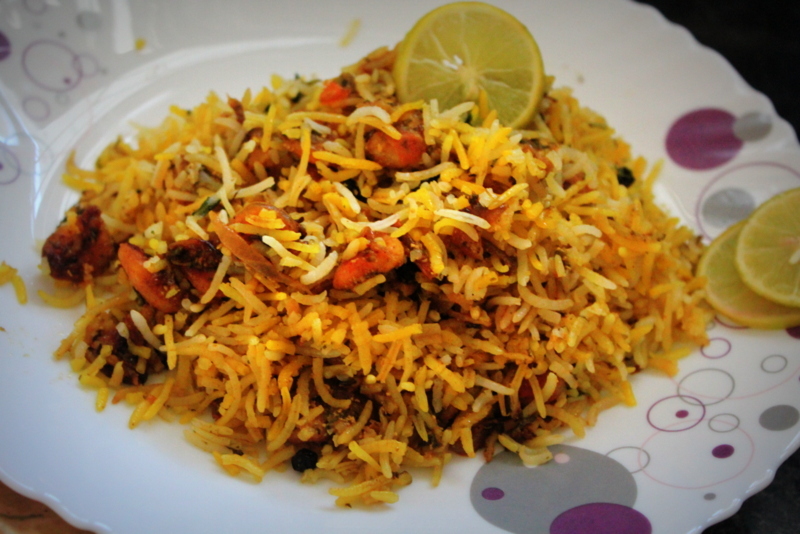 If you are sea food lover you will totally dig into this biryani. Spicy and tangy and utterly delicious, a truly awesome meal for all prawn-lovers!! Lets start cooking this awesome biryani!! Take the prawns in a bowl and add ginger garlic paste, red chilli powder and marinate for 10 minutes. In a thick bottomed kadhai/handi add equal amount of ghee and oil and fry marinated prawns on low flame for about 5 mins. Remove the prawns on to a plate and keep aside. 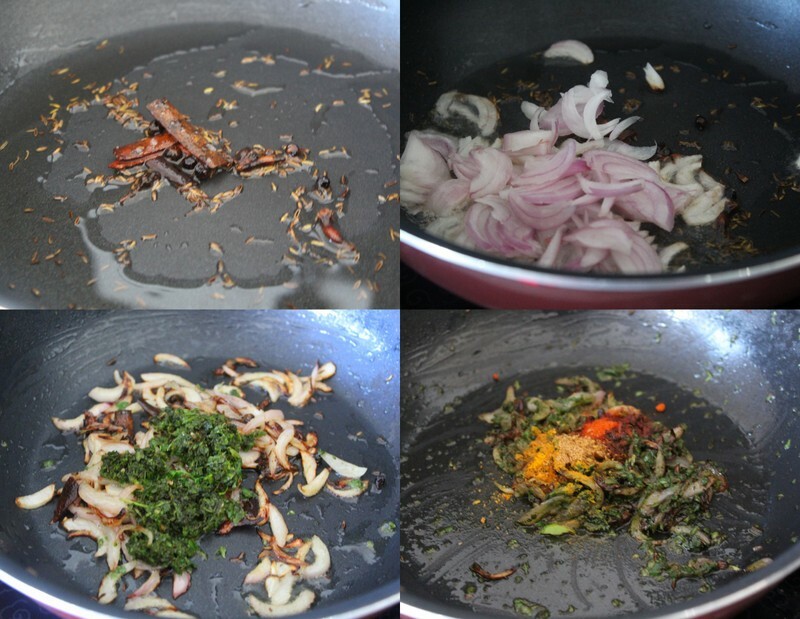 In the same shrimp flavored oil, add in half of the above mentioned whole the spices. Sometimes you might need another tbsp of oil or so. Now add in the sliced onions, let it saute till lightly browned. Meanwhile, grind green chillies, mint and coriander leaves coarsely. Add this masala to the golden brown onions and cook them for a minute. In another vessel, cook rice with 1 clove, cardamon, 1/2 inch cinnamon,1 bay leaf, salt. Pour some ghee on top and let the rice cook until its 3/4 cooked. 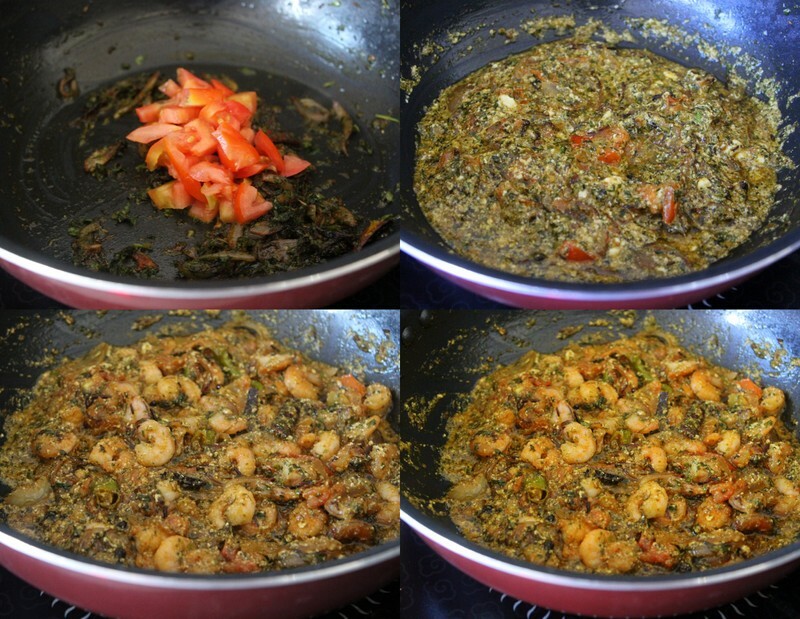 Add back the fried prawns and let it simmer away for a few minutes, so that the masala incorporates into it. 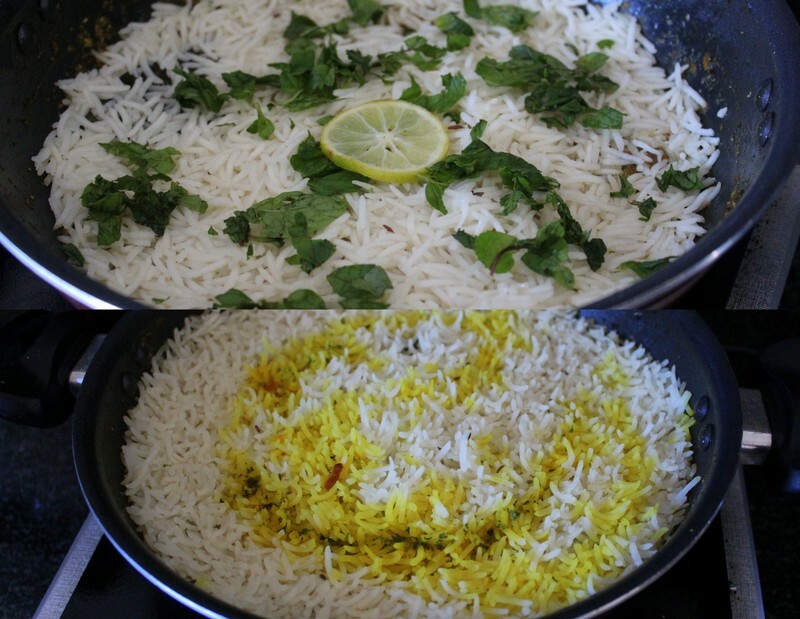 Now add the half cooked rice as first layer, on top it up with some more coriander leave and slice of lemon/lemon juice if you want some tanginess. Spread the 2nd layer of the rice. 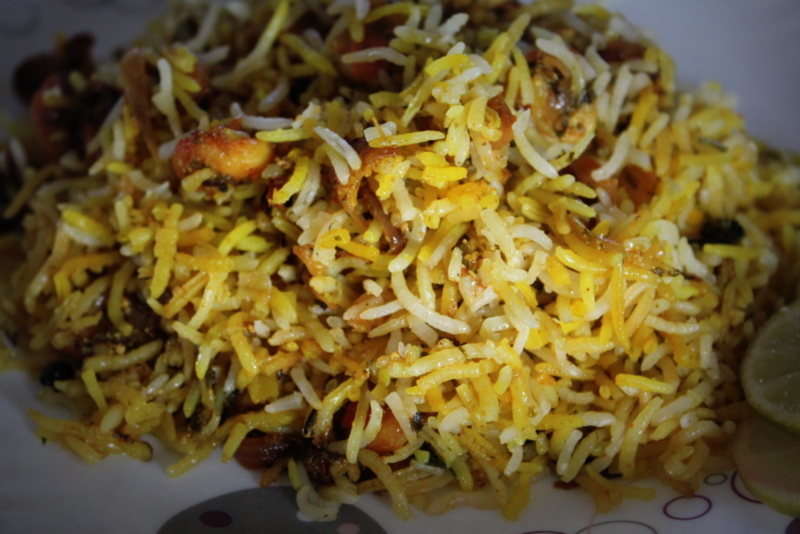 Mix few saffron sticks in milk and spread it over the rice.Cover with lid and let it simmer on low flame for 15 min. Serve with raita and some fresh salad. Enjoy! !